I received Simcity Societies as a Christmas gift long ago in 2007. Considering that I had only played it two times before last month, it must have gotten lost among other games of the time. One day I saw there was a demo for the game, and I wanting to test out my laptop, gave it another whirl. Over the course of my negligence, Simcity Societies received 5 extensive game-changing patches, adding trophies and awards, as well as a strategic mode that focuses less on the creative sector and more on city planning. Since I didn't play the game much during the patching interludes, I can't comment on how good it was originally. Unlike PC Gamer, I review games in the condition I play them, whether 10 minutes after release or 10 years. Therefore, what stands before you are recent experiences with the game. There are two main modes to the game, strategic, and creative. They have many similarities except that the strategy mode includes maintenance costs and other income-impeding effects, to make the game more challenging. Otherwise, gameplay is largely the same. These first paragraphs will deal with the creative mode of the game. When a was a child with an imagination, I would play Simcity 2000, cheat to give myself unlimited money, and then build a city with a story that crept out of the bowls of the basal ganglia. There would be the high security prison, surrounded by hydro-pumps, and a moat, with an escapee on a bulldozer. I would name structures in the city names that built up their history. And while the graphics and gameplay would often not reflect what I thought was occurring, my imagination would fill in the rest. Simcity Societies is an attempt to fix this, taking away the focus on extreme city management, and allowing someone to build a city they way they want it, filling it with a history that they have concocted in their head, and the diversity of art assets to complete it. 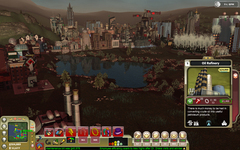 The Simcity Societies website even had spot to submit stories, where the player could write about their constructed city. Unfortunately, the game just doesn't go far enough in this way. Despite being able to build the city of their dreams, it feels too shallow. The population of the city, while getting personality from the buildings placed in the city, are almost faceless. You can click on them and see only a few basic characteristics, displayed as icons rather than need bars, and you can't import sims from The Sims, like you could in Simcity 4. Furthermore, despite being able to track them by clicking on their head, you can't favorite any sims. Once you unclick on them, they get lost in the ether of your city. Yet, even without being able to do much with the population, their appearance, and even gait serve to complete and add semblance of life to otherwise smoldering architecture. 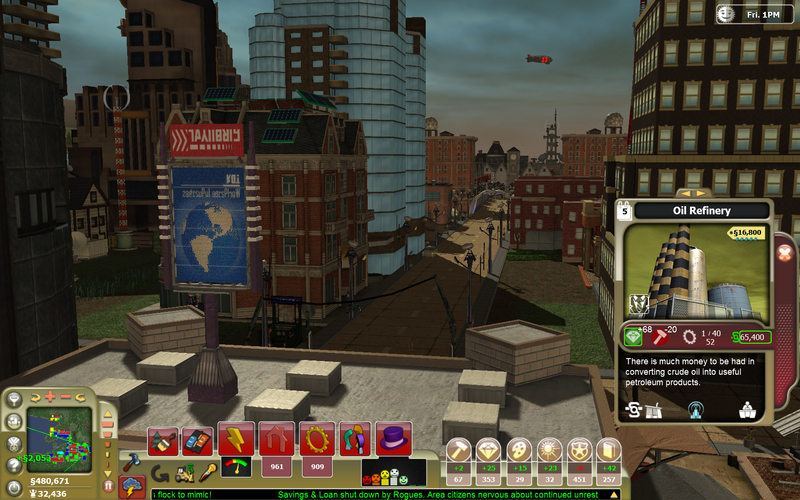 Renaming buildings is good, being able to call restaurant's Bob's or Joe's at a whim, but unlike Simcity 2000, with the huge skyscraping signs, unless you click on the building, you would hardly notice the difference of label. For a game that plays a little like a dollhouse, I wanted more control. Simcity 4 had driving vehicles, I wanted driving vehicles. How would Sam travel to the Barbershop by my own imagination without being in command? Maybe I want my doll to walk to work. Can I move him around the scenic hills of my city? No, I can't. 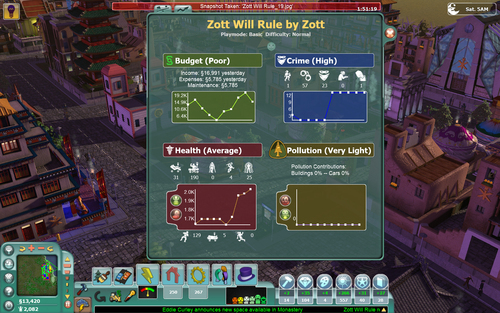 Simcity Societies should be a game with bits and pieces of both The Sims, having control over a sim, while also including the city building of Simcity. I don't want absolute control over every sim, that would take an insane amount of micromanagement, but I at least want the tools in place to make things happen when I want them too. I want to choose the types of cars on the street, I want to have monks roaming around a western style town. I don't care if it makes sense or not. To have an unhindered creative outlet, I need an unhindered sandbox. Leave the sense to the strategy mode, for those that wish to play Simcity Societies as a game. 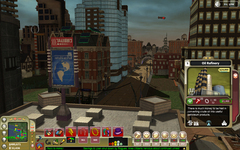 The game has six varieties of buildings, such as prosperity, and knowledge. These have no direct benefit to any Sims in the city. For example, building a school does not make sims smarter. Instead they either add or remove from a pool of that type which is needed for the constructing of additional buildings. Having enough points in each pool allow the unlocking of new buildings. Constructing an edifice without the production pool to support it, and the structure will not function. Sadly, if the player is focused on making their city expand, and not on the creative side, the guide to winning is to usually wait until you have enough money, and then build the recently unlocked buildings. These varieties of buildings also have the effect of transforming your city forwards a focus. Build only spiritual buildings, the music changes, the HUD becomes a mellow green, and the roads become ceramic tiles. Monks begin to traverse the city, spreading their words of wisdom, with an over-pompous walk. 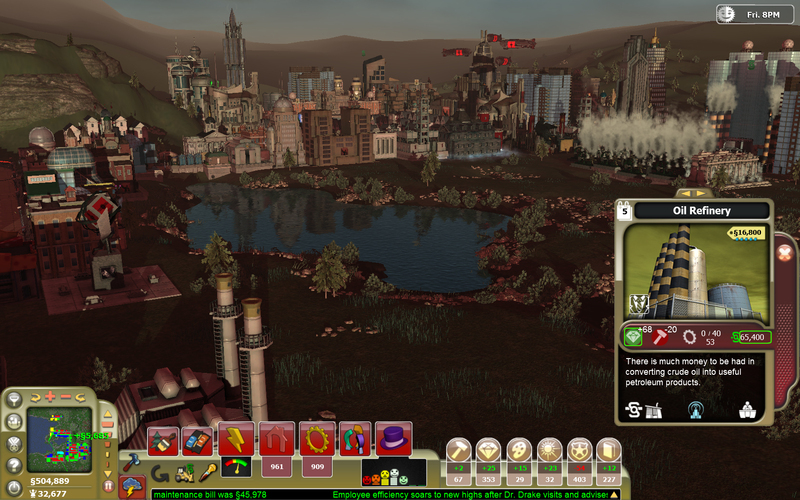 This was one part of Sim City Societies I especially liked. It let me know that my actions were having a direct effect on the inhabitants, and that there were distinct city-wide differences depending on choice of what to build. Seeing the HUD change, and the road were an additional surprise, and building cities, I worked to see what each type of city had for these portions. Alongside the mere constructing a city to look pretty and craft out-of-game plots, there is a strategy to it. Sims need homes, and so the player needs to build them. Sims also need work, and the player also needs to build those for his own checkbook. 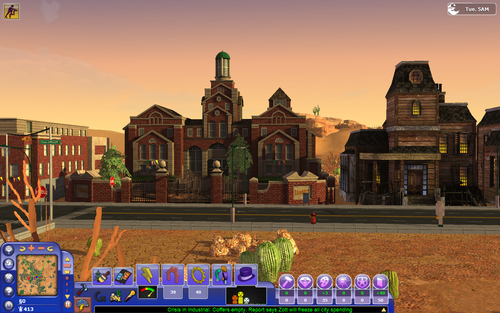 Sims need venues too, for without those, the Sims will have breakdowns where they will not work and shut down your city. For those focusing on making a city for telling a story, IE Free-play mode, this doesn't matter too much. 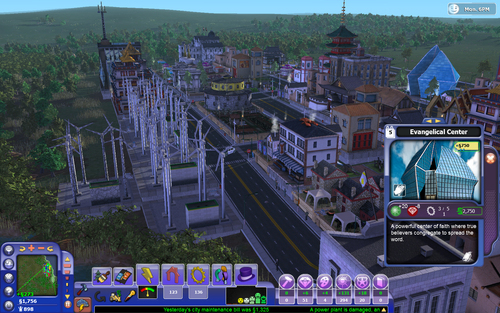 Except, for reasons I can't understand, the player still has to manage sim's happiness in their city. No utopia here, even if you want your sims to be happy with just a bar, and a tube house to live in. You can't force your sims to me happy, another unfortunate lost link to complete creative immersion, but as long as there is a balance of the three elements listed above, sim happiness usually settles itself. Except when it doesn't. For strategic mode, the beginning of the game is quite difficult. Later, with a stream of cash in, as long as that balance is maintained, the city is able function cleanly. In early game strategy mode, trying to keep the sims happy is the most stressing. They start off content and then seemingly get sick and refuse to work. The falling of the economy happens soon after. When the citizens of my fair city hit the rogue happiness level, it is game over. I haven't figured out a way to get them out of this state, besides destroying their homes to force them out of the city. Build a hospital so they don't get sick early on? So I do, and yet something else happens, and the economy fails. The beginning of the game then is a trial-and-error process. If you find the city is generating revenue, and the people are happy. Sit on the fast speed, and when enough money is collected, the rest of the city should work out fine. Otherwise, "New Game" and try again. The early game doesn't have the freedom I was hoping for. This is the biggest problem I had with the Strategy mode. There really wasn't much strategy involved. If the city generated money, it was a cycle of, construct a building that satisfies need, wait for money, build a house, wait for more money, build a venue, money, work, money repeat. If the creative elements were more full as I mentioned, then perhaps I could entertain myself while waiting for the money, but I often walked off, letting the game run. I don't feel this is how a fun game should be played. There wasn't enough intermediary elements in-between the money flow to keep me interested. 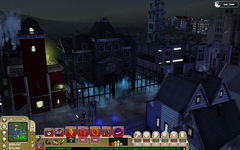 Some buildings had opportunities that had special functions, but many required money, and others could be set to automatically trigger (Thank you, it would have been annoying for a large city anyways), so there is no need to focus managing those during the downtime. Management of funds is rudimentary at best, and having been added in a patch post-production, it isn't as sophisticated as I wanted. I wasn't looking for a Tropico-style management textbook, but something better than 5 nearly un-customizable charts would have been nice. It is good to know that I spent $$$ on maintenance, but which buildings are the heavy hitters? Which buildings are making me the most money? As the player you're unable to see this on a global scale without clicking around on each building. Was this what they expected me to do while I wait for the pay-checks? Furthermore, some professions are not worked 7 days a week, but it is difficult to see how this affects the city on a wide scale with the tools available. There are a couple overhead icons that tell the usage of the different trait pools of the buildings, as well as some other proximity effects. Unfortunately, the spinning rings as a means of showing area of effect make no sense to me. Are they meant to show immediate "touching" distance? Occasionally there are random events, these may hurt or help you. Donations make buildings of a certain type cheaper, while there may be stock crashes, or spiritual holidays that remove income. Besides fires, nothing is too bad. Even fires seem to go out on their own, causing a building to require maintenance to become functioning again, rather than being consumed outright by the inferno. Crippling building leveling disasters are possible, but are only player triggered. 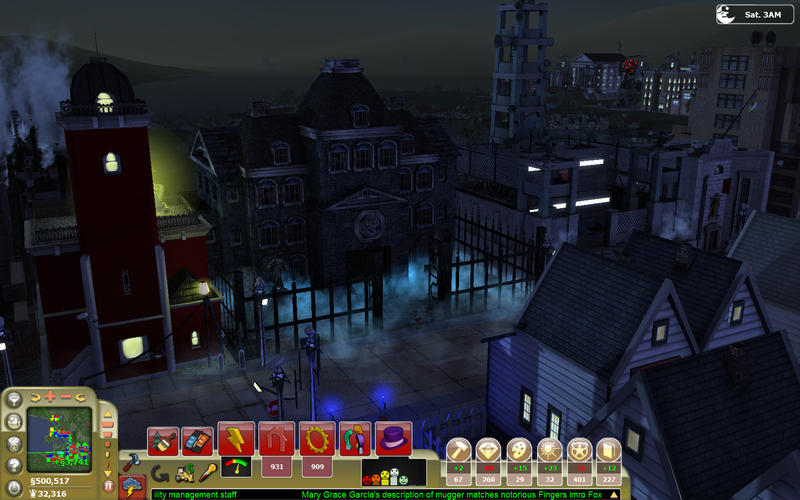 Thankfully the patch-added disasters are entertaining; imagine a giant burger sign gone rogue. Graphically, the game is candy for the eyes. Each building has shadows that move as the day to night transition happens, and at the maximum settings, the city is beautiful. Even on the lowest settings, I was surprised at the level of detail the artists managed to put into the placeables, with smoke rising from smoke-stacks, and burgers roasting on a grill. This comes at a cost however, for a late 2007 game, it needs a fairly recent system to turn on all the settings. I found that the lighting from the sun moving through the sky caused the biggest performance loss, and turning that off allowed most other settings to be maxed at playable frames per seconds on my 9700m GT. The best part? There are a plethora of buildings and architecture to choose from. If I was locked up in a room for 24 hours, I'm not sure I could come up with as many different building varieties as Simcity Societies has. They aren't all contemporary styles either; there are pagodas, and tribal halls, churches, oil refineries and more. 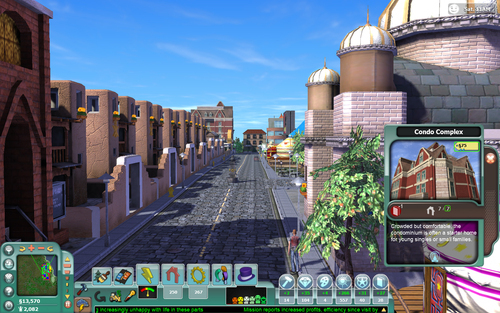 For those that play the game for the creativity modes, watching the city buzz with the non-repeated buildings will be a treat. The sounds are not quite as good. The Sims speak their simglish, but there isn't enough of it. Another symptom of a possible rushed game, I would constantly hear the same simglish noises being emitted from my city. If a game is going to have random noises, I don't want to have my attention drawn to it unless it is important. Each building has its own select sound, why not randomize a couple of those for ambiance? The chatter rising up from the streets brings back memories of the throwing up and coughing sound from Theme Park in its reoccurrence, except it served a purpose in that game, and that game had weaker hardware requirements. There isn't enough music for the ratio spent listening to each song and yet I will let that pass, since each style of city gets its own soundtrack and the Authoritarian one crushed my opposition in concert with my actions. Before I wrap this review up, let me say that this is a buggy game. It has crashed more than 7 times on me, and you don't know what causes it. It isn't like one particular building or one part of the game that sets it off to die. This makes it all the more frustrating, since its random crashes like to destroy your city building. Thankfully, though this is a somewhat morose thanks, the game has an auto-save, and you can use a slider to choose when to auto-save in minutes, as few as one. I'm not saying you should save every one minute, it isn't THAT bad, but I had my slider to THREE minutes, so consider yourself warned. I can't believe any game that has had 5 patches could be a crashtastic as this one. In conclusion, Sim City Societies might have fulfilled desires as a means of generating compelling stories. One might use The Sims, for the inside building portions, then hop over to Simcity Societies to record the city in which they frolic. Unfortunately, with limited direct controls over the actual Sims, and not enough copywriting and annotation abilities, it doesn't quite hold up that way. Instead, the strategy portion is what most people will end up playing, and it too is lacking. The early game is too stressful, and slow, while the endgame is too formulaic and repetitive. The management tools needed to run the city properly are missing as well. The real delight of SimCity Societies is being able to construct the city and be dazzled at the structures that exist in it along with the exquisite detail the artists put into it. You may be entertained for a while with the strategy portion, but lacking depth, Simcity Societies is only as good as you are willing to put into the creative aspect of the game. Misc Note: The game is highly customizable. There is an exchange on the Simcity website to download user created buildings and even people. I'm not sure how difficult it is to make things, but if you are bored with the offerings of the game, you could always try and craft your own items to place game-side. Even if you aren't interest in generating new buildings, it is quite easy to change the settings in the game. I changed the game speed to nearly 3 magnitudes faster since I grew bored of waiting for the days to pass. Be warned, not all the settings you change are safe, and increase the chances of crashing higher than the already far too high rate.